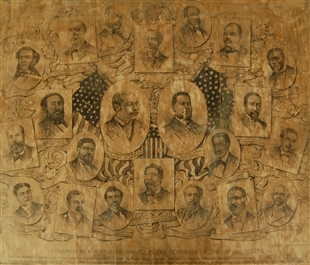 When journalist Edward Cooper published this print, in 1907, depicting the 23 African Americans who had served in Congress, he could not have known it would be more than 20 years before their number would be added to again. 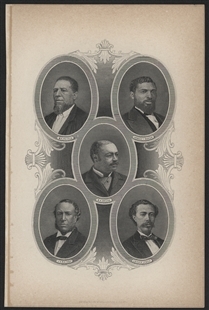 Between 1901 and 1929, the height of the Jim Crow era, not a single African American was elected to Congress. Cooper himself suffered mightily under Jim Crow discrimination. After running several influential black newspapers, he struggled in the early 1900s, serving as a government clerk and entrepreneur in Washington. 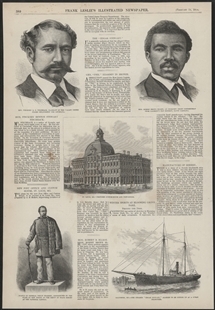 This print, an extremely rare example of early 20th century black political art, was one of his projects. Its composition draws from the look of scrapbook montages.